First (Commercially) Released: This video is currently not available on retail format. Rock And Roll Love Affair (stylized as 'Rock & Roll Love Affair' in the videos intro) is the first Prince video to have been broadcast officially on a YouTube TV Channel. On 19 November 2012 Purple Music facebook account announced that the video would be premiered the same week as the release of Rock And Roll Love Affair single. The video was streamed on 22 November 2012 on Corriere Della Sera website before being removed. IM1 Web TV also streamed the video later the same day at 2:00 PM (CET), followed by Tape TV website. The next day, the video was made available in HD format on Purple Music YouTube TV Channel. The video shows Prince singing, playing guitar and keyboards in Paisley Park's Studio C, rehearsal room (a.k.a. the "NPG Music Club" formerly the "Love4Oneanother room"). He is backed by Ida Nielsen on bass, Andy Allo on guitar and Hannah Ford on drums. 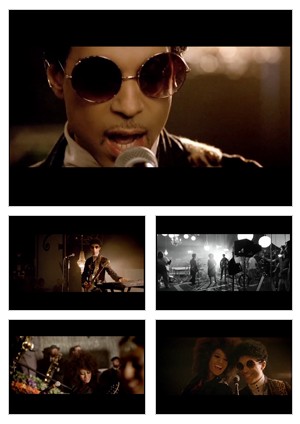 The video contains shots from a directors perspective, close-ups of Prince, Hannah Ford, Andy Allo and Ida Nielsen, both in color and black and white. In addition of shots of Prince and his trio band, a few shots show several horns players in the aisles of the room, paired with different models serving as personal assistants, holding sheet music while they play their part. A glimpse of "Reine Keis Quintet", a painting by C'Babi Bayoc, used in 2001 for The Rainbow Children album artwork, can be seen in the background of a side shot of Ida Nielsen and Andy Allo. The rehearsal room carpet also features the NPG Music Club logo. It is unlikely that inclusion of these references of earlier Prince projects are intentional. This page was last modified on 27 February 2016, at 21:35.